When Hipstamatic came out, I had a tendency to not use it. While the ‘retro’ camera effect was fun for many shots, it took so long to get the image from snap to library, I moved on. The app offers all sorts of ‘lenses’, ‘films’, and ‘flashes’. Which, act as filters, but adds to the romance of photography. The setting up the shot prior to taking it rather than enhancing a photo afterwards. The Hipstamatic app offers the lens/film/flash options in little bundles, or as they call them, ‘packs’. A new pack was released in time for the holiday dinners, Foodie SnapPak. The SnapPak bundle includes Loftus Lens, DC Film and Tasty Pop Flash. Below is an image I took without the flash on. The flash adds a washout to the white areas of the image to add to the effect. 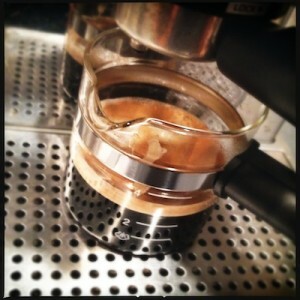 In my house, espresso is in the food group. The Foodie SnapPak is positioned around the photography of your feast food items.